If you’ve been in a motorcycle accident, you’re likely scared and may be fighting for your life. You should be focused on your recovery – not fighting with insurance companies. Our Pittsburgh motorcycle accident lawyers can help you manage the legal process and fight for the maximum compensation you deserve. Motorcycle accidents have horrific consequences for victims. Nearly 80% of accidents result in hospitalization or death. Unfortunately, about two-thirds of these accidents are caused by unsafe motorists – not the motorcyclist. Have you been injured in a motorcycle accident? If so, you’re likely scared and unsure of who you can trust. You might be dealing with mounting medical bills, motorcycle repair costs, or potential loss of wages. After an accident, your focus should be on your recovery. Not dealing with the stresses caused by your accident. That’s how the best Pittsburgh motorcycle accident lawyers can help. A qualified attorney’s job is to fight for the maximum compensation for your injuries. Your lawyer manages the entire legal process, so you can dedicate yourself to recovering. If you’ve been injured in an accident, we want to help. Call us today for a free case evaluation to learn more about your rights. An experienced Pittsburgh motorcycle accident lawyer provides an aggressive defense of your rights, and investigates your accident to learn who was at fault. Your lawyer will start by collecting evidence and building your case. Should You Hire a Pittsburgh Motorcycle Accident Lawyer? For victims, this process can be daunting, and as you recover from your injuries, you likely don’t have the energy to deal with all the legal details. An attorney you can trust helps you manage this process confidently. Following a motorcycle accident, victims face many new challenges – both financial, emotional, and physical. They may experience significant pain and physical trauma, emotional stress, and financial challenges from mounting medicals and vehicle repairs. As a victim, you’re entitled to compensation for your pain, suffering, and emotional distress. Damages include the financial compensation to pay for any costs associated with your accident. You may file claims for two types of compensation: compensatory and punitive damages. Punitive: This type of compensation is a form of financial punishment, and it’s reserved for cases where the accident was caused due to gross negligence or malice. Punitive damages are determined by a jury, and they are awarded if your case goes to trial. Ultimately, your lawyer can help you determine if punitive damages are an appropriate legal avenue. Seek Medical Attention – Your health and safety should be your first concern. If you’re able to, call 911. If you’re too injured to call, a witness or other motorists will do so on your behalf. Move Out of Harm’s Way – If you are located in oncoming traffic, move to a safe location near the accident scene. Police Statements – Police will interview you, the other driver, and witnesses at the scene. Provide as many details as possible, but do not admit fault. You may be in shock, or unaware of the legal rules of the road, and therefore wrongfully implicate yourself. DO NOT Admit Fault – Avoid discussing who caused the accident with investigators and insurance companies. Admitting fault to police, insurance adjusters, or witnesses at the scene can damage your case. Contact a lawyer before answering questions about fault. Collect Evidence – If you are able to, collect evidence at the scene. Take photos and video of the site, collect contact information from witnesses, and get insurance and contact information from the other driver. If you are unable to do this, your attorney will assist and use police reports to help build your case. Seek Legal Counsel – You should seek a qualified motorcycle attorney as soon as possible after the crash. If you’re able to, contact a lawyer from the scene. Otherwise, seek legal advice as soon as you’re able to. Waiting too long can damage your case. Pennsylvania is a “choice no-fault” state. That means you file claims for physical pain and suffering with your insurance, regardless of who caused the accident. Property damages, on the other hand, are filed with the negligent or at-fault party. We strongly recommend that you do not talk with insurance companies without first seeking legal counsel. Insurers – even your own – are always concerned with the bottom line. They rarely put your best interests forward, and may bully or strongarm you into accepting an unfair settlement or compensation. A qualified lawyer protects you against aggressive insurance tactics from the at-fault party. You’re not required by law to speak with insurers. When you hire a motorcycle accident attorney, all of these calls can be forwarded to your attorney. How Are Motorcycle Claims Different? Bias against bikers. If you ride, you probably already know that many people stereotype bikers as gang members, risk takers, and even criminals. This bias works against bikers, even when they are the innocent victim of a careless or negligent driver. Police officers, insurance adjusters, and judges are often more willing to pass blame on to the biker when an accident happens, even if the rider played no part. An experienced attorney will anticipate this discrimination and fight to defend his client. More severe injuries. A motorcycle rider does not have much protection when he hits a car or the pavement and the result can be catastrophic injuries, including paralysis, traumatic brain injury, loss of limb, and more. These kinds of injuries require special consideration when seeking financial compensation, and a motorcycle accident attorney will know how to negotiate for these. Insufficient insurance. If the driver who caused the crash is only carrying the state minimum insurance, as many people do, it will likely not be enough money to compensate a seriously injured biker. An attorney will know where to look for additional compensation, including the at-fault driver’s personal assets and potential third-party sources. Lack of understanding about motorcycles. Even those who do not have a negative view of motorcyclists often fail to understand how motorcycles work, and how careless drivers can put them at risk. For example, a motorcyclist may choose to “lay down” his bike rather than colliding with a car that has cut him off, but this does not mean he is responsible for the crash. Misunderstanding of helmet law. In Pennsylvania, any rider over the age of 21 who has at least two years of riding experience or has taken a certified riding course, may choose not to wear a helmet. This is a right allowed by law and should not be used against the biker in arguments over responsibility. Even a biker who chooses not to wear a helmet is entitled to a safe riding environment. A motorcycle accident attorney has the experience to deal with the helmet issue head-on. You may think your motorcycle crash case is cut and dried—you were obeying all traffic laws when another driver cut you off or ran you off the road. However, you will face challenges that drivers of cars and trucks do not face. Make sure you have experienced motorcycle accident attorneys by your side. Do I need an attorney for my motorcycle crash claim? After your motorcycle crash, you were probably contacted by the other driver’s insurance company and offered a quick settlement. You may be wondering if you should accept the cash or talk to someone about it first, but you’ve never been in an accident and would not even know who to talk to. If you find yourself in this situation, you may want to consult a motorcycle accident attorney. Severe injuries. Because a motorcyclist is only protected by what he wears on his body, his injuries can be catastrophic when he is run off the road or hit by a car. A biker can suffer traumatic brain injury, spinal cord damage, or limb amputations. Having an attorney speak for him allows the motorcyclist to focus on his prognosis and recovery. High medical costs. Catastrophic injuries come with astronomical medical bills. The cost of emergency treatment, medical testing, consultations with specialists, and multiple surgeries can exceed a million dollars. Factor in ongoing therapies and possible life-long care, and you will need an advocate arguing for maximum damages. Bias towards bikers. Drivers, insurance adjusters, law enforcement officers, and even judges can carry a bias towards motorcyclists that can affect the outcome of an injury claim. A motorcycle accident attorney is experienced in countering this bias and arguing for the settlement you deserve. Pennsylvania helmet law. In Pennsylvania, you have the right not to wear a helmet if you are over the age of 21 and have taken a motorcycle safety course. If you exercise this right and are injured by a negligent driver, the lawyer for the at-fault driver may argue that you chose to endanger your own life. You will need an attorney defending your right and placing blame where it belongs—with the negligent driver. How Should I Find the Right Attorney? When you’re considering hiring a lawyer to represent you in a motorcycle accident claim, there are several things you will want to consider. Number one, does the lawyer have any experience in representing motorcycle riders? It’s a very different case than just a car accident case, and your lawyer has to understand that, and has to understand the injuries that motorcycle riders suffer when they’re struck by a vehicle. You also want a lawyer who’s a trial lawyer, not a lawyer who’s looking to quickly settle your claim, but a lawyer who’s willing to investigate the case and prove the case in court if need be. Finally, anytime you’re hiring a lawyer, it’s important for you to develop some sort of rapport with the person, to trust them, to respect them and to believe that they’re in your corner, because if you do need to try the case, you’re going to have a long relationship with that lawyer, so it needs to be someone that you feel comfortable working with and that you know will represent you to the best of their ability. What Mistakes Can I Avoid? Some of the mistakes that people injured in a motorcycle accident make is not beginning to build their case early on. One of the most important steps in building your case is contacting an attorney who has some experience with motorcycle accident cases, is willing to investigate the case, and try the case if need be. Another mistake that people make when they’re injured in a motorcycle case is not following up or taking the treatment that they need seriously. There’s a tendency from people to want to be better, and to try to pretend that they are better. Not continuing to follow with medical care, and not reporting the problems that you are having is a mistake. Frankly, people don’t want to be seen as being weak or soft, so they try to push on. You want to get back to your life, but you also have to continue to document your injuries and to let your doctors know the problems that you’re having, most importantly because you want to get better, and your best chance of getting better is being honest and straight with your doctor. Also, because once your case is being reviewed by an insurance company, they only take you seriously if you are treating and proving your damages. Your word just isn’t good enough for the insurance companies, so you need to document them and you need to have a lawyer help you through the process. Are Motorcycle Claims Different Than Car Claims? There are a lot of lawyers who have experience or say they have experience representing people in car accident cases. Some of those lawyers make the mistake of believing that that experience also gives them the know-how to represent someone injured in a motorcycle accident. Although there are similarities between motorcycle accidents and car accidents, there are also differences, and your lawyer needs to understand that. They need to understand that because of the very nature of you being on a motorcycle, your injuries can be much more serious. They also need to understand that there is a tendency out there to try to blame the motorcycle rider just because they were on a motorcycle. You need a lawyer who has been through those types of cases and who is willing, if need be, to try that case to a verdict. Can I recover damages if I was partly to blame for a motorcycle accident in Pennsylvania? A motorcycle accident can turn a rider’s life upside down, leaving him or her with serious injuries and an outrageous amount of unexpected medical debt. Pennsylvania tort law allows motorcyclists hurt in accidents caused by another person or entity’s negligence to pursue compensation through a personal injury lawsuit. Many injured motorcyclists may be hesitant to take legal action, particularly if they’re concerned they might be partially at fault for the crash and their injuries. Fortunately, when it comes to personal injury cases, Pennsylvania follows modified comparative fault rules. This means motorcycle accident victims may still be eligible to collect damages, even if they were partially at fault. Still, in order to collect compensation, the biker must be less responsible for the accident than the other involved party. Comparative negligence laws can potentially reduce an injured motorcyclist’s settlement—or even bar them from collecting compensation if they’re more than 51 percent responsible. A knowledgeable personal injury attorney can help motorcycle accident victims find and gather information they need to build a strong case for their claim and the other party’s liability. Motorcycle accidents can leave riders with serious injuries that temporarily—or even permanently—affect their ability to work and care for themselves. What motorcyclists do in the moments, days, and weeks following a crash can have a significant impact on their ability to collect compensation for their injuries and other losses. Take photos or video of injuries, property damages and the accident scene. Collect contact information from drivers and passengers in involved vehicles, as well as witnesses to the accident. Don’t place or accept blame for the accident. When speaking with the police, keep answers honest, factual, and concise. Seek immediate medical attention, even if your injuries appear minor. Make sure the treating physician documents your injuries as having been sustained in a motorcycle crash. Don’t provide a recorded statement for an insurance company—yours or the other party’s. No matter how friendly the adjuster may be, the company might not have your best interests in mind, and what you say in the recording could be misconstrued and used against you. Don’t give the other party’s insurance company authorization to view your medical records. Consult a personal injury attorney as soon as possible. A personal injury attorney with experience handling motorcycle accident cases can help you understand your legal rights and options, and advise you on how and what to say when talking to insurance companies. After my motorcycle accident, should I give a recorded statement to the insurance company? After being involved in a motorcycle crash, accident victims often field numerous calls from insurance companies—both their own and the other driver’s—asking for recorded statements about the crash, the resulting injuries, and property damage. Usually these calls are made by friendly-sounding insurance adjusters who imply that providing a recorded statement is necessary to resolve the claim. This is not the case. Giving a recorded statement to an insurance company without first consulting with motorcycle accident attorneys can seriously harm a personal injury insurance claim or subsequent personal injury lawsuit. In addition to complying with legal requirements, motorcyclists purchase insurance to protect themselves financially in the event of an accident. However, insurance companies are businesses and like most, their ultimate loyalties are to the company’s bottom line, not an accident victim’s well-being. To that end, insurance companies and adjusters look for ways to minimize their financial obligations after an accident. Misspeaking during a recorded phone call with the insurance company can help them achieve that goal. Unfortunately, these types of calls can be difficult for injured motorcyclists to avoid. That’s why consulting an attorney before providing a recorded statement to an insurance company is absolutely essential. Experienced personal injury attorneys can help motorcycle accident victims protect their rights by advising them on what to say during a recorded statement, as well as how to phrase their answers to avoid misunderstandings. Can I file a lawsuit after a motorcycle accident if I wasn’t wearing a helmet? Motorcycle helmets approved by the U.S. Department of Transportation (DOT) are approximately 67 percent effective in preventing brain injuries, and nearly 40 percent effective in preventing motorcycle accident fatalities. In fact, helmets saved the lives of nearly 2,000 motorcyclists in 2016 alone, according to the Centers for Disease Control and Prevention (CDC). Despite decades of research showing the efficacy of motorcycle helmets, many motorcyclists choose not to wear this essential piece of safety gear. After being injured in an accident, these same motorcyclists often wonder if—and how—failure to wear a helmet might impact their ability to file a personal injury lawsuit and seek compensation for damages. The answer to the question depends on a variety of factors, including your state’s helmet laws, injuries, and ability to show the defendant was negligent and directly responsible for said injuries. Pennsylvania repealed its mandatory helmet law in 2003. As a result, only motorcyclists under the age of 21 who lack two years of riding experience or the completion of an approved motorcycle safety course are required to wear a helmet when operating or riding a motorcycle. Still, failing to wear a helmet might throw a wrench in the works if the primary injuries sustained were to the head or brain, as the defense might try to argue the injuries were the result of not wearing a helmet. Fortunately, because Pennsylvania is a “comparative fault” state, motorcyclists can still collect damages, even if they were partially responsible for their injuries. However, the damages they might collect may be reduced. What kinds of insurance coverage do motorcyclists need in Pennsylvania? Motorcycle accidents can have serious physical and financial consequences for everyone involved, especially motorcyclists, who tend to suffer the brunt of the injuries in these types of collisions. Motorcyclists who have their license or registration suspended may also be required to pay a restoration fee to have those privileges restored. While carrying the mandated minimum liability insurance puts motorcyclists in compliance with Pennsylvania’s insurance laws, it doesn’t protect them from losses they could incur in an accident. For more complete protection, bikers can turn to options such as comprehensive coverage, or policies that include uninsured/underinsured motorist coverage. Some Pennsylvania insurance providers may even offer discounts for motorcyclists who’ve completed certain safety courses, or who have safe driving records or bikes with factory installed anti-lock braking systems. They may also be able to get a better deal by buying multiple insurance policies—such as car, motorcycle, and homeowners insurance—from the same provider. What happens if I’m rear-ended while riding my motorcycle? Rear-end accidents are often relatively minor when they occur between two passenger vehicles, but these crashes can be devastating when they involve a passenger vehicle hitting a motorcycle. Statistics from a 2015 report conducted by the National Highway Traffic Safety Administration indicated there were more than 4,600 fatal motorcycle crashes in the U.S.—170 of those in Pennsylvania. reduced judgment or slowed reaction times, such as drunk, drugged, or drowsy drivers. Unlike people riding in a vehicle, a motorcyclist has no steel frame of protection in the event of a crash. The severity of the accident and resulting injuries depend in part on the vehicle’s speed at the time of impact. Even at low speeds, a motorcyclist can be forcibly thrown from the bike. At high speeds, the front of the vehicle can lift the motorcycle’s rear tire, hurling the motorcyclist to the ground or even under the vehicle. After being rear-ended, an injured motorcyclist may need extensive medical care and require time off work for recovery. While this can put a strain on an accident victim’s finances, if the crash was caused by a negligent motorist, a knowledgeable personal injury attorney can help pursue compensation for medical expenses, lost wages, pain and suffering, and other damages. What If I’m Hurt on a Motorcycle? 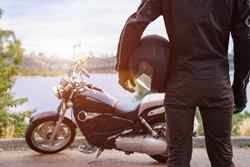 One of the most important things to consider about a motorcycle accident in Pennsylvania is that just by the nature of the incident, the injuries tend to be much more serious and have greater consequences for the motorcycle rider. You also have to understand that there is a prejudice where people are often quick to blame the motorcycle driver, whether it’s right or not. It’s important that your lawyer understand these facts and they’re prepared and experienced in how to deal with and defend you against that belief that the motorcyclist must’ve been to blame for their own accident. Do I Have a Claim as a Passenger? If you’re a passenger on a motorcycle involved in a collision, you have the right to make a claim. You may have a claim against the operator of the motorcycle on which you’re a passenger, or you may have a claim against the other vehicle involved in that accident. For that reason, it’s important for you to contact a lawyer who is willing to represent you, against both the other vehicle and against the operator of the motorcycle on which you were a passenger. Do I Have a Claim if I Was Run Off the Road? In addition to those motorcycle accidents where the bike was actually struck by another vehicle, there are incidents where you can be injured as a motorcycle rider when you’re forced off the road or forced to lay the bike down due to the negligent driving of another vehicle. In those instances, it’s very important that you contact a lawyer early on so that they can begin the investigation, including inspecting and documenting the scene. There may be evidence that will help prove that another vehicle forced you off the road. One of the most difficult questions that a lawyer can be asked by a client is, “What’s my case worth?” What makes that so hard is that every person and every case is unique. The most important factor to valuing a case is how the injuries affect your life. Until a lawyer understands your injuries, your lifestyle, your job, it’s very difficult for them to evaluate the case. I hear many stories where potential clients are told in an initial meeting what their case is worth. I’m not sure how a lawyer can do that without the proper investigation and without waiting and finding out whether their client recovers, what that recovery takes, and the affect the recovery has had on the client’s life. If you’ve been involved in a motorcycle accident in Pittsburgh, we want to help. Our experienced legal team will provide an aggressive defense of your rights and help you fight for the maximum compensation for your injuries and losses. Contact us today for a free case evaluation. Our team will help you determine if you have a claim and we can advise on how to proceed. These evaluations are 100% no obligation. You choose to ride a motorcycle because you love the feeling of freedom you get as you cruise down the highway or zip around Pittsburgh. However, the day a careless driver pulled out in front of you changed everything. You could not possibly stop in time, nor could you maneuver around her, so you crashed right into the side of her car and suffered serious injuries. What should you do now? Because motorcyclists face certain challenges when seeking compensation for injuries, we recommend hiring a law firm with motorcycle experience to represent you. The Accident & Injury Law Group is just such a firm. Their attorneys will help you get the compensation you need to recover from your injuries.